Storing your AeroPress has never been easier. Designed specifically for the AeroPress Coffee Maker, this caddy serves both as a drying rack and as an attractive display case to be featured on your coffee bar. Easy to assemble and built to last, this caddy frees up counter space and eliminates the daily headache of looking for your AeroPress in the dishwasher. 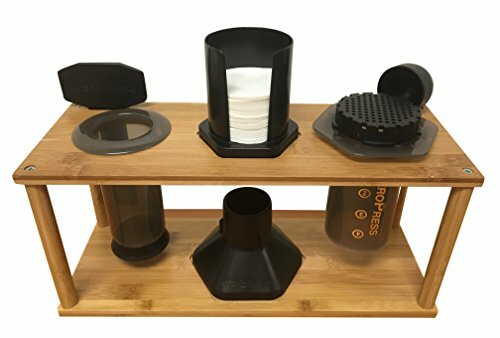 Make your daily coffee brewing routine painless with the Bamboo AeroPress Caddy from Java Barrel. Handcrafted from eco-friendly, cutting board quality bamboo. Handy AeroPress Coffee Maker accessory that doubles as a drying rack and organizer. The name AeroPress is trademarked and owned by Aerobie, Inc. Java Barrel is not associated with Aerobie or the AeroPress. AeroPress coffee maker not included. If you have any questions about this product by Java Barrel, contact us by completing and submitting the form below. If you are looking for a specif part number, please include it with your message.